After our weekend at GMX in Nashville, Loss and I took advantage of our Monday off work and made a stop in my old college town, Murfreesboro, Tennessee. 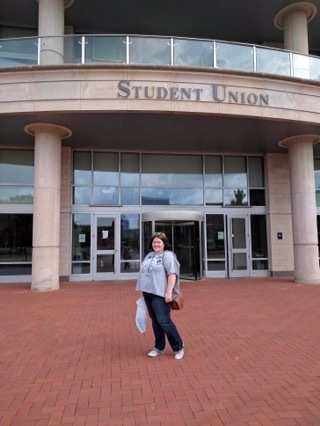 We had lunch at one of my old favorites, Sir Pizza, and then took a little walk around the MTSU (Middle TN State University) campus with my friend from that still lives in town, Sarah. Returning the scene of the freshman year! We revisited some places in my past, and a photo in front of my first dorm, circa 2005, had to happen. Of course, I’m sharing a throw back picture here- down in the lobby, one random fall or winter night. I hadn’t been back on campus, pretty much, since I graduated with my undergrad degree in English back in 2010 and so much has changed. Granted, Peck Hall, where I pretty much lived my last two years at MTSU, has barely changed at all. 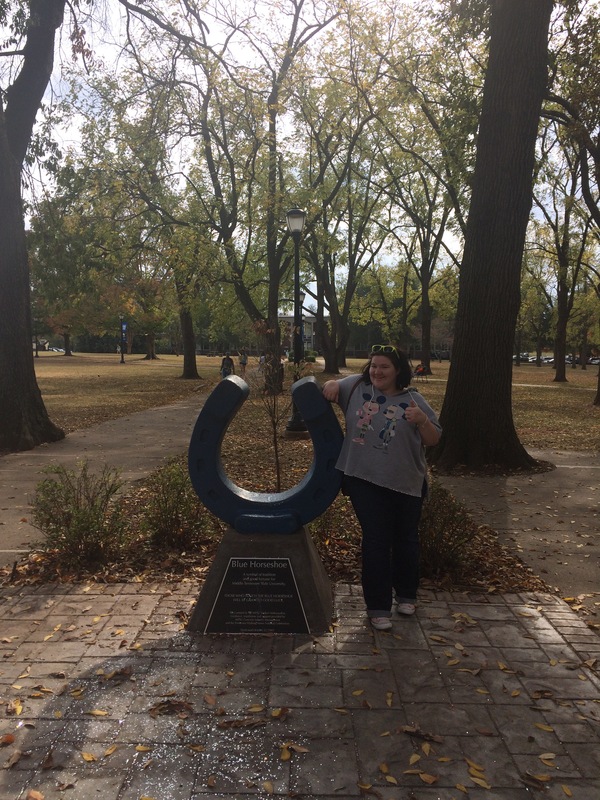 The blue horseshoe is outside of Peck Hall and is where they normally do the Raider Walk (basically a pep rally) before the football games. Yeah, I never really went to football games but twice, but it’s something I’m coming around to the idea of more now. We also made a stop at Kirksey Old Main, one of the oldest buildings on the awesome campus, and made sure a legend was made come true. 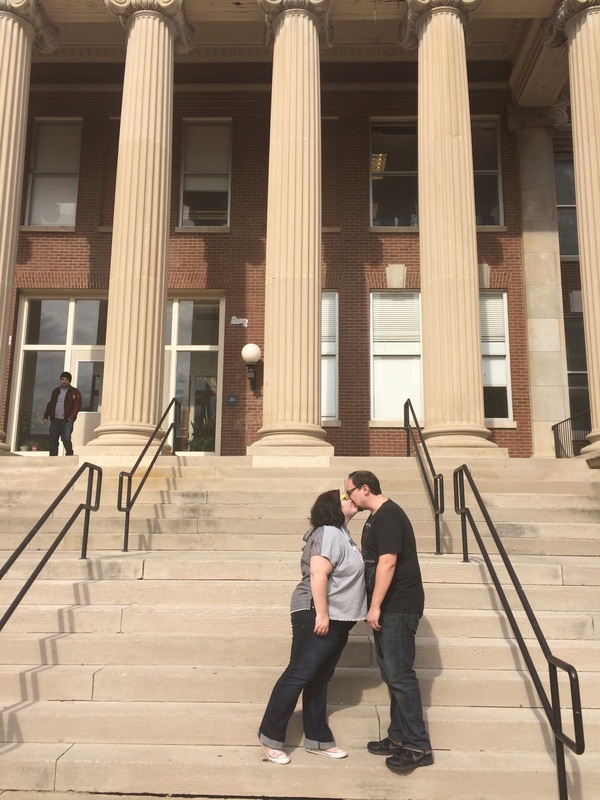 I remember hearing on a tour of campus way back when that if you kiss your love on the steps of the KOM, it’ll be forever. So, well, we wanted to make sure that the legend is true. After making Loss take another kissy photo, we ventured to find the new buildings on campus- one of which I didn’t even know existed! We saw the new science building- it looks like a crazy NASA building- and it’s super gorgeous inside- amazing! We also took a little trek into the new Student Union building. It opened up a year or two after I left and, WOW, I’m glad to know that my tuition all those years helped pay for it. You guys, it was gorgeous. Look at all this pretty wood & fancy restaurants! So there’s the blast from my past. I feel like it’s been long enough since I’ve been at MT, so now I’m ready to be sentimental and love it. I picked up an alumni shirt while I was on campus and am looking to get an MT tervis at some point this fall. I’m even debating going to homecoming next year! I love my little adopted hometown of Murfreesboro and even though I don’t visit as often as I should, it’s a great place and holds a very special place in my heart. Thanks for the tour, Sarah!